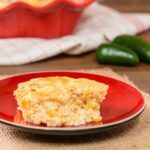 A recipe for a spicy corn casserole made with corn kernels, jalapeño pepper, hot sauce, and eggs. It is a fluffy casserole with a sweet/hot combination of flavors. Preheat oven to 325 degrees F. Lightly grease a shallow 2-quart baking dish. Place 2 cups corn kernels and eggs in a food processor fitted with a knife blade. Process until corn is finely ground (will not be completely smooth). Heat olive oil in a small skillet over medium heat. Add onion, bell pepper, and jalapeño pepper. Cook until softened, about 3 to 5 minutes, stirring occasionally. Add garlic to the skillet and cook until fragrant, about 1 minute. Remove skillet from heat. Add Tabasco® sauce. Bring milk to a simmer in a medium saucepan (do not boil). Remove from heat and stir in the vegetables and remaining 3 cups corn kernels. Add the egg/corn mixture slowly while stirring vigorously. Pour into prepared baking dish and bake until center is set and firm, about 1 hour. Note that baking time can vary depending on baking dish used. You can adjust heat level by using less or more of jalapeño and Tabasco® sauce.